Enjoy five historical novels by some of Christian fiction's bestselling authors. 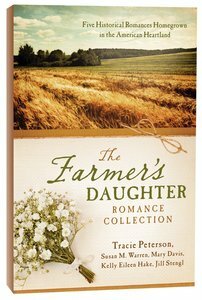 Meet daughters of prairie farms from Montana south to Kansas who find love in the midst of turbulent life changes. Marty's nieces are kidnapped. Rosalind's town is overrun by a railroad company. Amy's jealousy comes between her and her twin. Beulah's answer is needed to a marriage proposal. Lilly's choice puts her at odd with her neighbors. Into each of their lives rides a man who may only make their situations worse. About "5in1: The Farmer's Daughter Romance Collection"
A credentialed Secondary English teacher from Anaheim, California, Kelly Eileen Hake is pursuing an MA in Writing Popular Fiction. Jill Stengl lives in Wisconsin with her husband and children with whom she has shared her love of writing. Susan Warren recently returned home after serving eight years with her husband and four children as missionaries in Khaborovsk in Far East Russia. Susan holds a BA in mass communications from the University of Minnesota and is a multipublished author of novellas and novels. Susan has an amazing gift for writing complex plots and weaving powerful Christian content throughout her stories. She and her family live in Northern Minnesota.